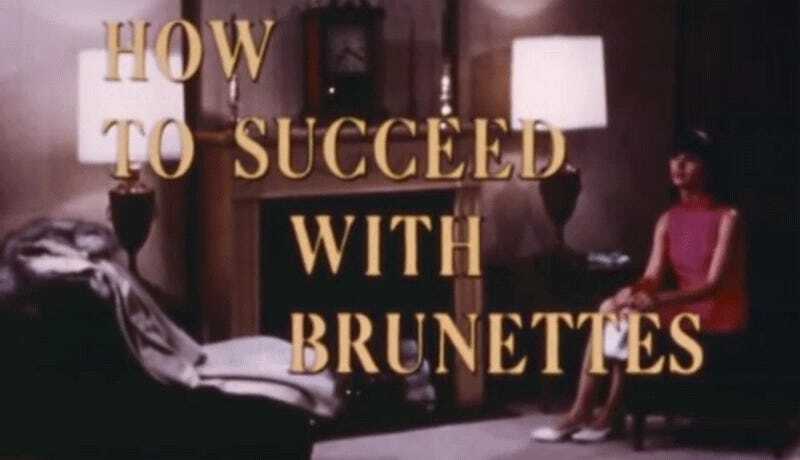 When I saw the title for this 1967 US Navy film, “How to Succeed With Brunettes,” I expected that it would be silly and pretty sexist. But what I didn’t expect was that such a simple movie would cost about a quarter of a million dollars to produce. According to the National Archives, the 1967 film cost about $64,000 to make along with a companion film “Blondes Prefer Gentlemen.” That’s almost half a million dollars adjusted for inflation to make the two movies. And if you watch the film it’s mind-boggling where that money could’ve gone. The whole thing has maybe half a dozen locations, including a movie theater and very basic interiors like a living room and a restaurant. The narrator opens each scene by facetiously explaining how it’s great that the man is doing things like walking in front of his date and not opening the car door for her. We see each scenario a second time with the “proper” way of doing things, like letting the woman go first and ordering her food for her. The US military made all kinds of movies in the 20th century that dealt with not only important operational duties, but also etiquette and manners. With the film “How to Succeed With Brunettes,” we get a very tongue-in-cheek film with a narrator that first gives some really bad advice like arriving late to your date in order to let her know that you’re important. According to the National Archives, the CBS TV news magazine 60 Minutes “awarded” the movie with a sarcastic “Oscar” for being such a ridiculous waste of money. 60 Minutes premiered in 1968, the year after the film was produced. I think my favorite thing about the whole film is the opening music. So if you don’t watch the whole thing, at least turn on the sound for the first bit. You can watch both “How to Succeed With Brunettes,” and “Blondes Prefer Gentlemen” on YouTube.